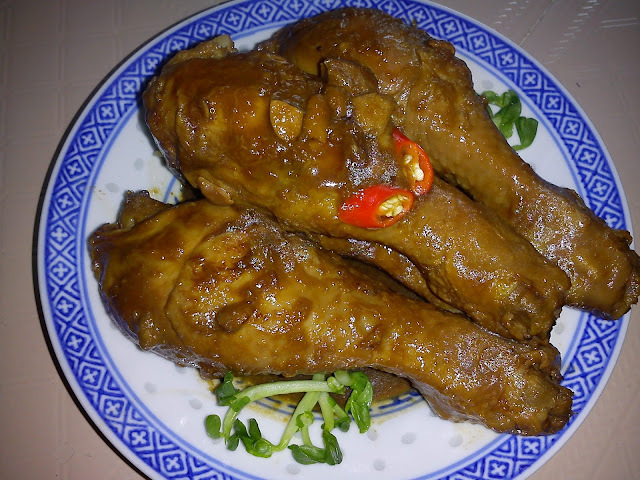 Ayam Sioh or Sioh Chicken is a Nyonya dish. It is a home-cooked favourite in most Nyonya households with minimal ingredients easily found in the kitchen. 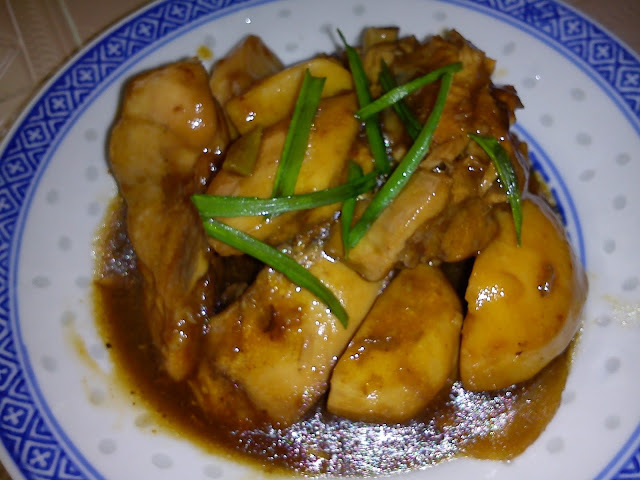 The combination of coriander powder, tamarind and taucheong [preserved bean paste] with seasoning of sugar and salt give this dish its' sweet, savoury and sourish tasty that is very appetising. 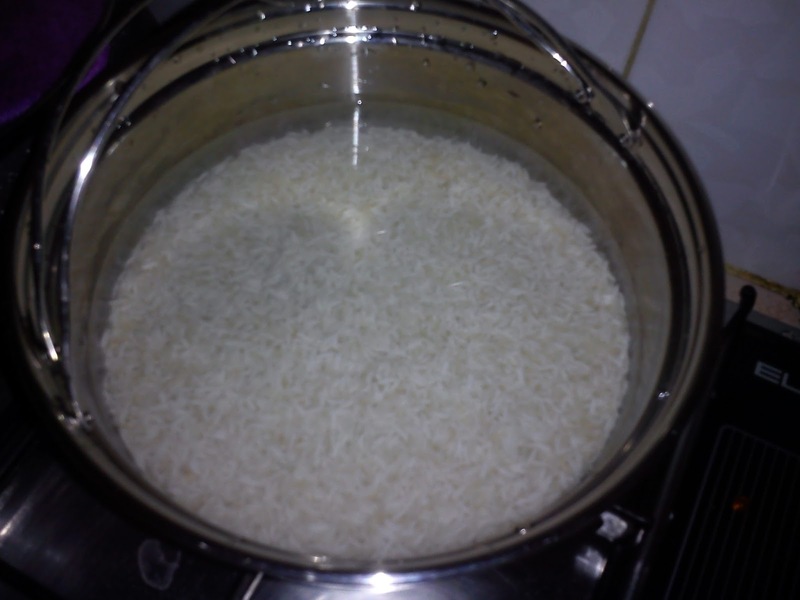 Here, I used the Thermal Cooker to cook this dish which is so much easier and hassle-free. 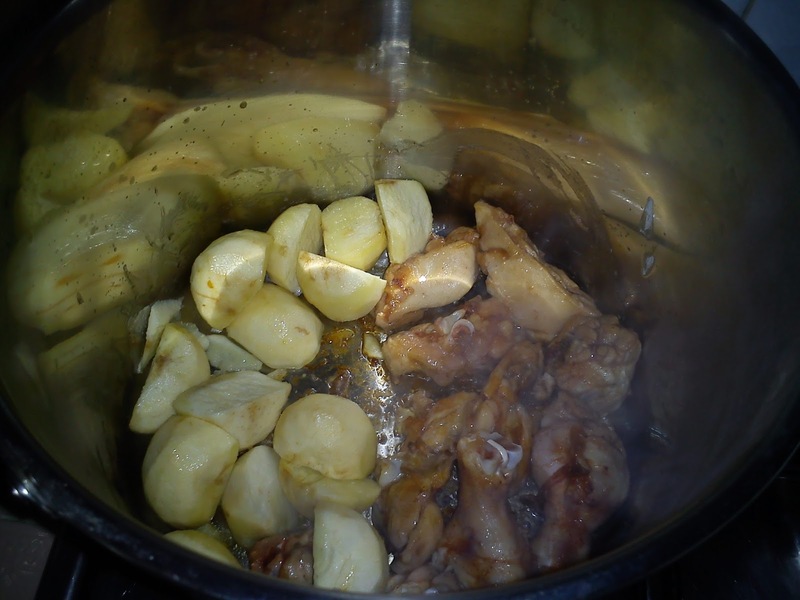 There is no necessity to watch over the stove until the chicken is tender and gravy has thickened. Just fry the ingredients until fragrant, add in the necessary liquid, bring to boil and leave the remaining cooking process in the Thermal Cooker. 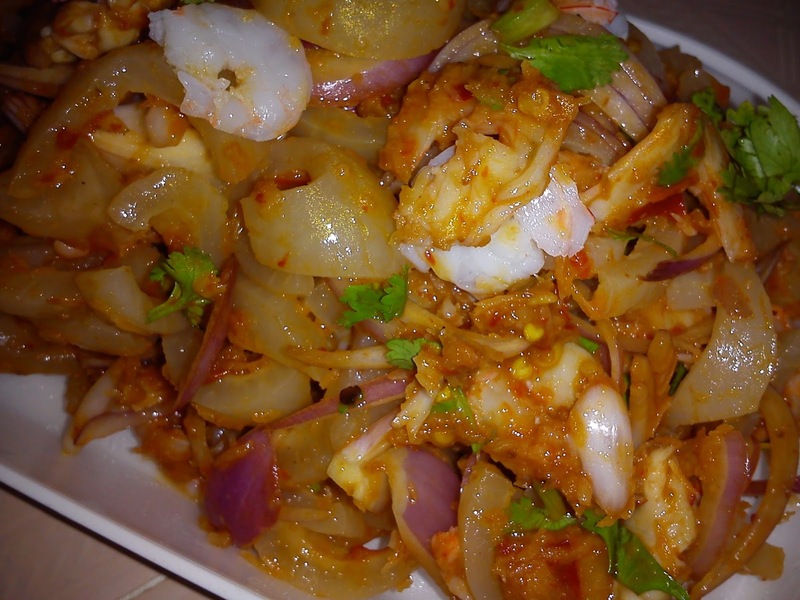 This preparation takes about 15-20 minutes only and in 2 hours the dish is ready to be served. I did this in the morning before leaving home and by dinner time, the tasty chicken is ready and still warm in the cooker. I cooked half portion of this recipe but it is worthy to cook the whole portion if you have a big family of 6 cos' it is good. 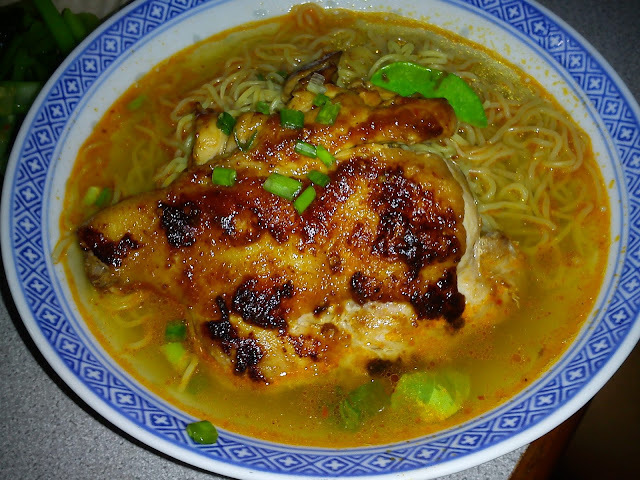 The recipe is adapted from Nyonya Flavours [my selected cookbook for Cookbook Countdown Event - February 2016]. 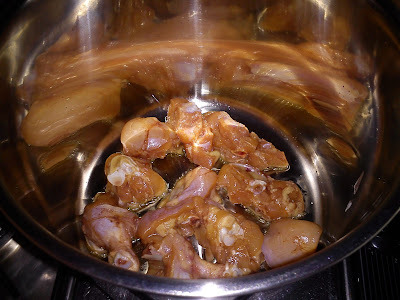 Heat up thermal cooker pot, add in oil, shallot pulp, saute until aromatic and brown. 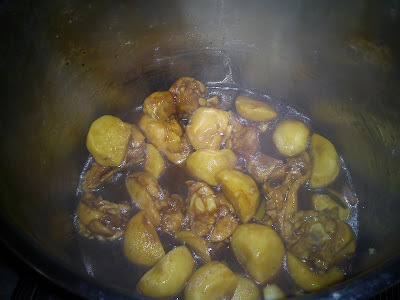 Add in bean paste and chicken, stir to mix ingredients well, then add in coriander powder and dark soy sauce. 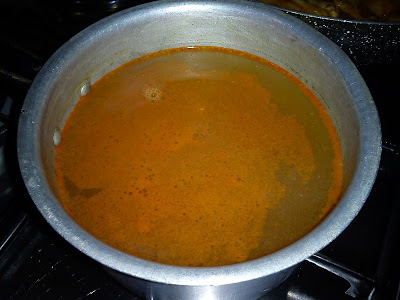 Give it a good stir and pour in shallot juice, tamarind juice and some water. 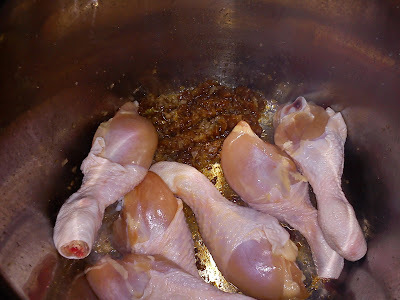 Add in seasoning, bring to boil, then simmer for about 6-10 minutes. 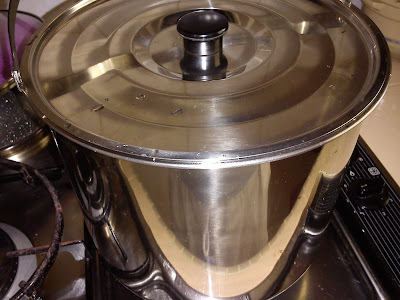 Off heat, cover the pot, transfer to the outer pot and close the lid. 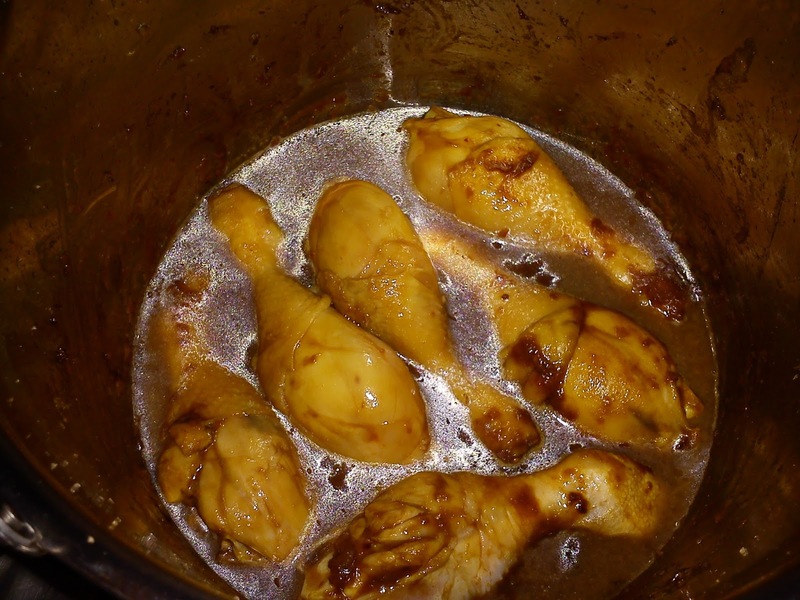 Leave the chicken to cook for a further 2 hours. 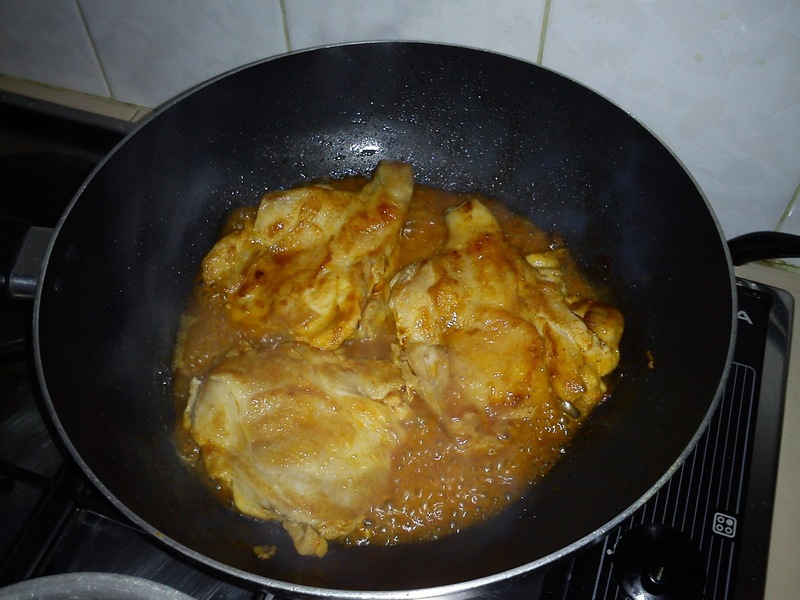 Note - If using normal wok, add enough water to cover chicken, bring to boil and simmer until it is cooked and gravy is thick. Have you tried having fried tom yam chicken in noodle soup? This one is rather extraordinary to me, that is having fresh wantan noodles soup with tom yam flavoured fried chicken instead of the usual BBQ pork [char siew] and wantan dumplings. 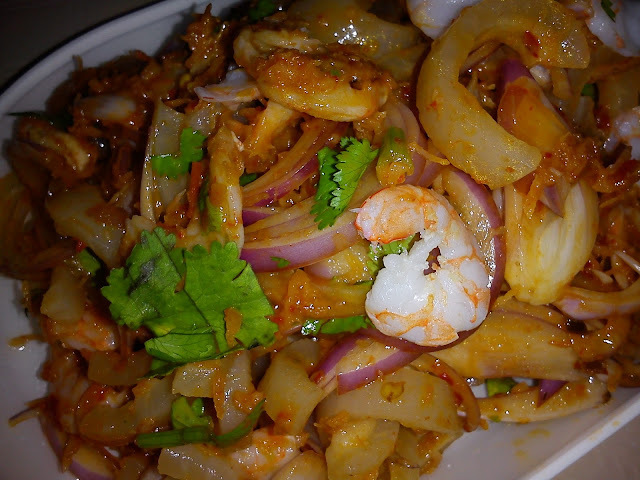 I didn’t regret trying out this noodle dish cos’ it is good. 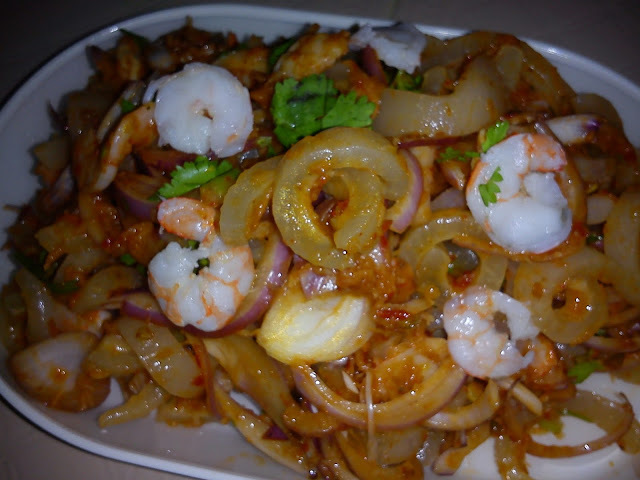 Actually, it is okay to use any kind of noodles [instant or fresh noodles according to own preference], not necessary wantan noodles. 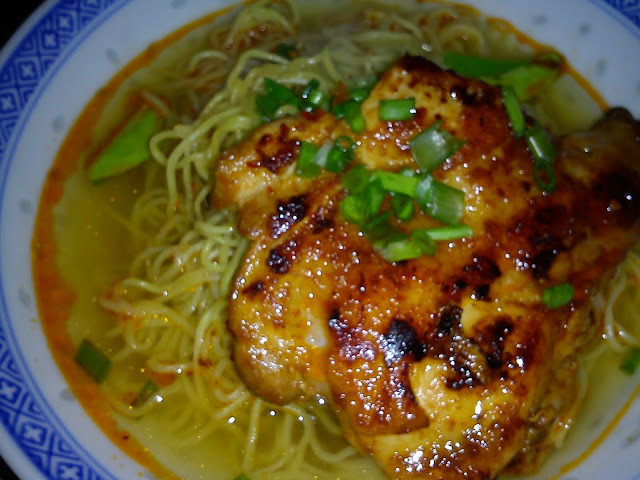 Just blanch to cook, place on serving bowl, top with a piece of fried chicken, pour in some hot soup with a sprinkle of spring onions, that’s about all and you get to enjoy a lovely chicken noodle soup in your own kitchen. Not many photos has been taken cos' I didn't intend to share the recipe before tasting it. 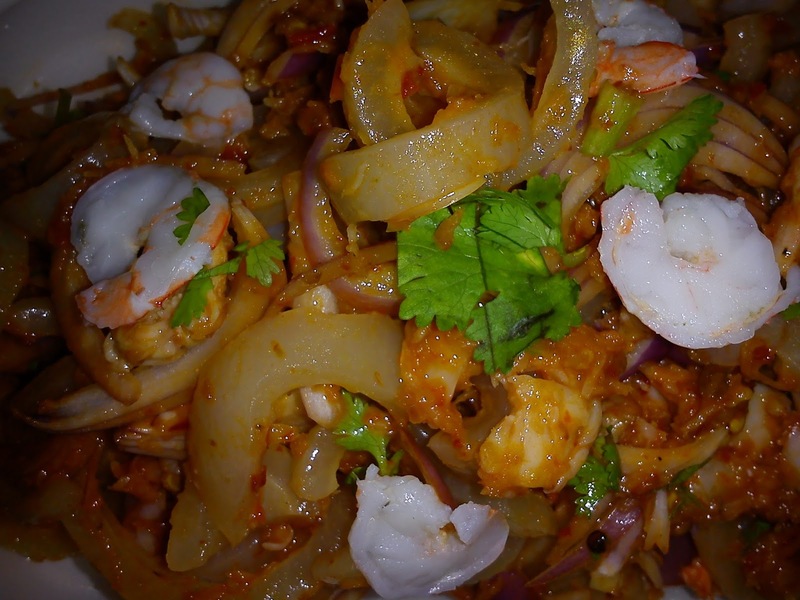 But afterwards I was prompted to write this post as I intend to prepare this noodle dish again cos' it is good and easy to prepare. You can chopped up the fried chicken if you like but keeping it whole is more hassle free to me. 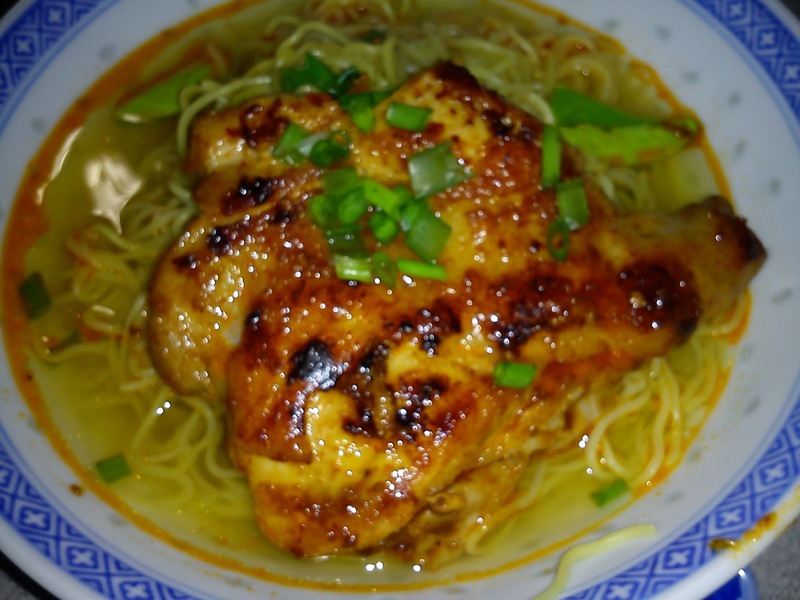 Bring water or chicken stock to boil and keep it simmering while you fry the chicken and blanch the noodles. Heat enough water to blanch noodles until cooked. Dish up into individual serving bowl. 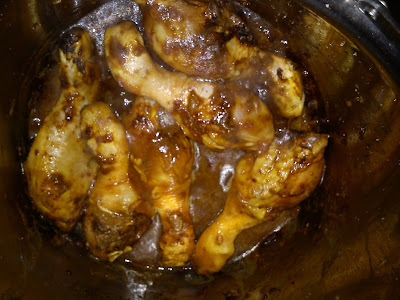 Heat a non-stick pan, pan fry chicken whole legs [skin side down] until oil oozes out and golden brown. 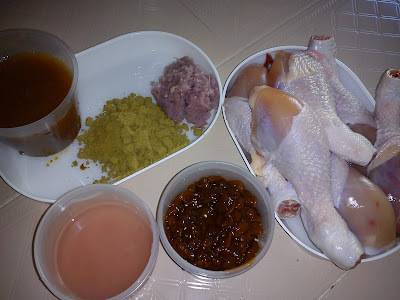 Spread tom yam paste all over the chicken meat before turning over to fry the meat side until cooked, browned and gravy reduced. Pour excess tom yam paste into simmering soup, taste to adjust seasoning [salt and sugar]. Place fried chicken on top of cooked noodles, add in some kaffir lime leaves, then scoop enough boiling soup into bowl and garnish with some chopped spring onions. 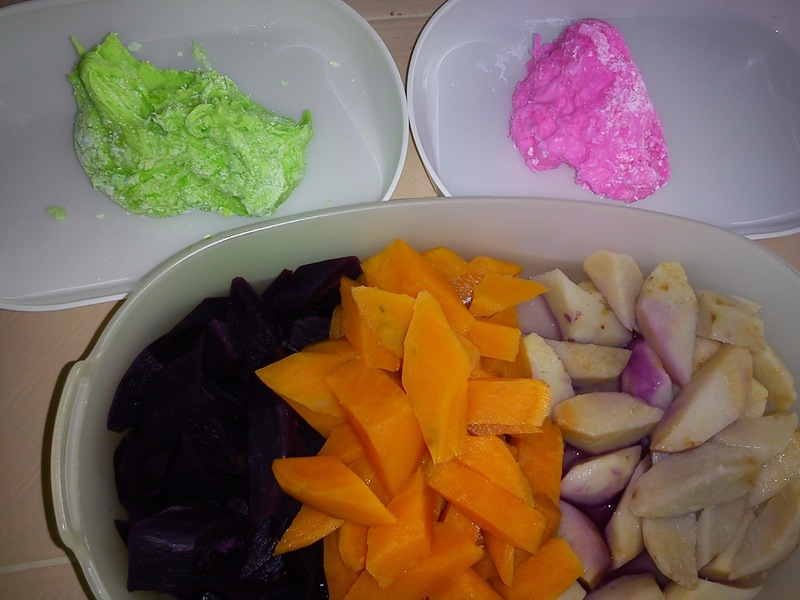 This is the first time I prepare this Kerabu. 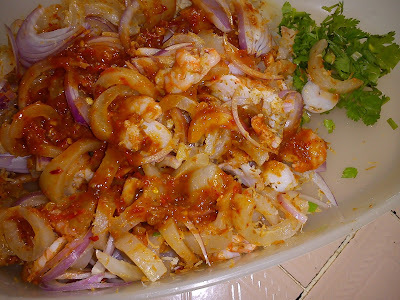 The more common Kerabu which I know are Jellyfish Kerabu, Kerabu Bok Nee and Mixed Vegetable Salad etc. 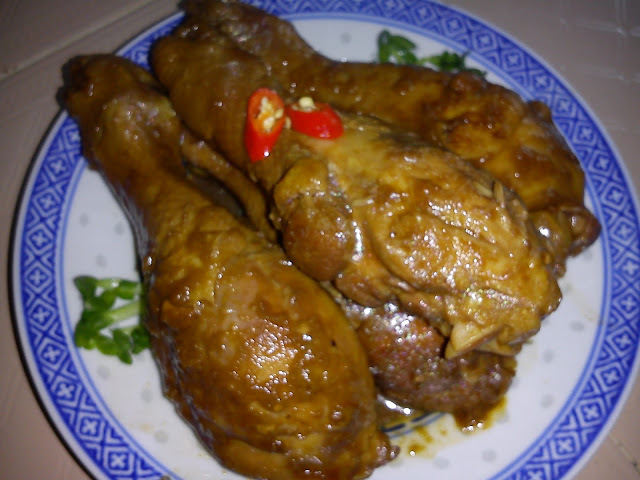 I have seen this recipe from the book Nyonya Flavours but never thought of trying it until yesterday when I had in hand some very nice pork skin from the butcher. So this is it, crunchy, tasty and spicy pork skin kerabu. This salad is packed with collagen from the pork skin. The recipe is very simple from Nyonya Flavours [my selected cookbook for Cookbook Countdown Event - February 2016]. Bring a pot of water to boil, add in the pork skin. Boil until soft but still firm to the bite about 20-25 minutes. Drain and cool. Cut the skin into thin strips [>1 cm] or finer as preferred. 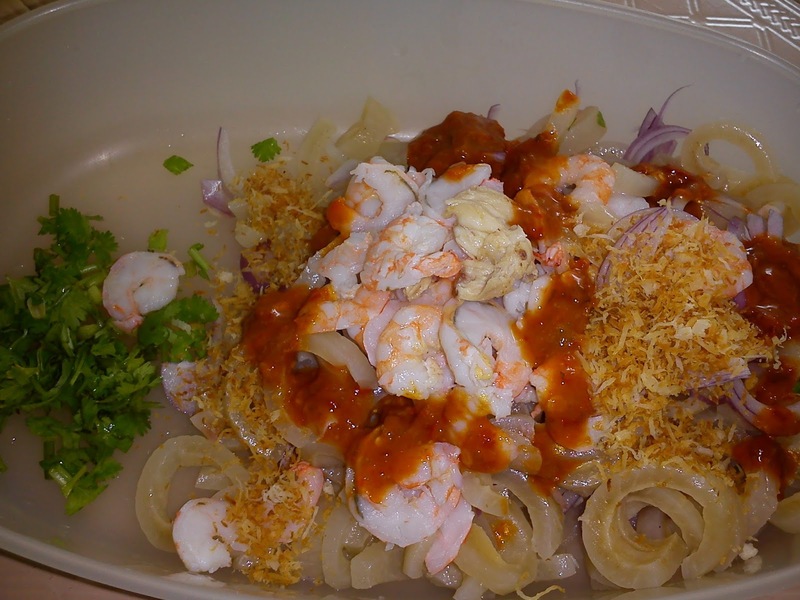 Toss pork skin with remaining ingredients and dressing. * Note - To clean the pork skin, wash with salt, cornstarch and some water. Scrape the surface with a sharp knife, shaving off any bristles. Also slice off any excess fats that may be attached to the skin. Blanch pork skin in hot water, then boil in a pot of clean water [step 1]. 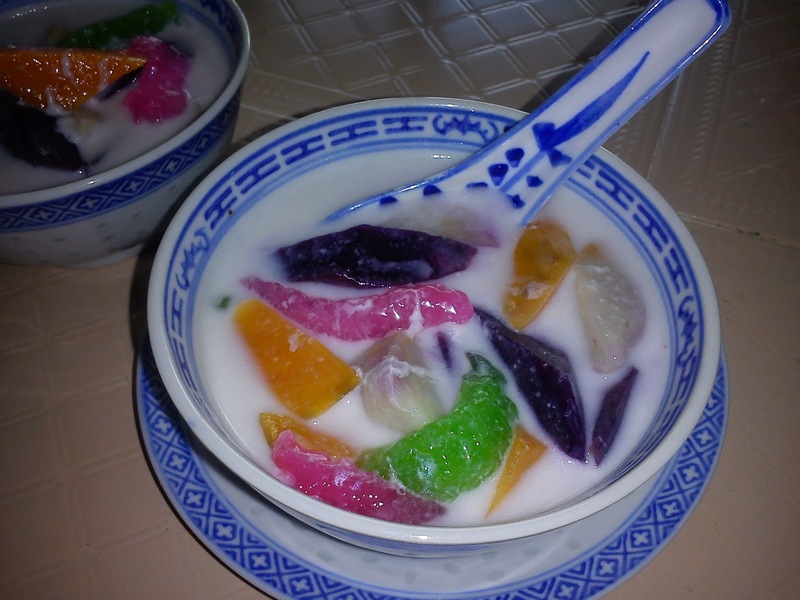 Bubur Cha Cha [Sweet Potato and Taro Medley in Light Coconut Sauce] - this is the dessert that most Hokkien Chinese in Penang or northern Malaysia will cook on Chap Goh Meh [15th day of Chinese New Year]. Of course, there are many versions of it, cooked according to each individual family's preference. 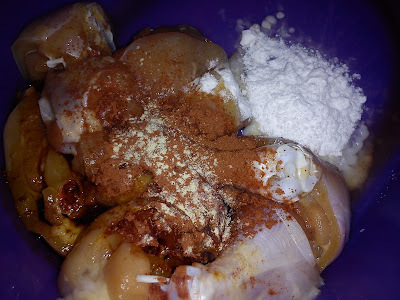 My mum used to cook this years ago but I didn't want to follow her recipe cos' she dumps everything in one pot and the coconut cream is no longer white in colour. 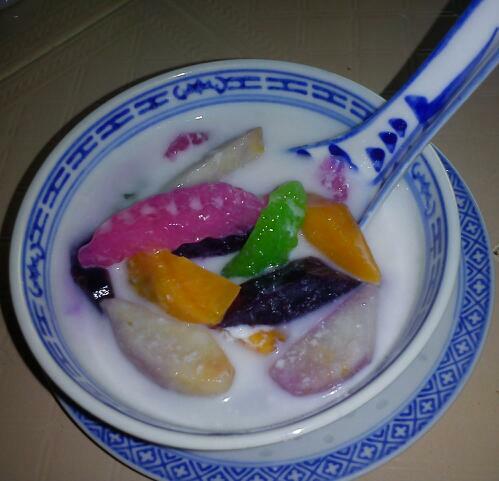 I prefer the sauce milky white and the other ingredients remain so colourful. 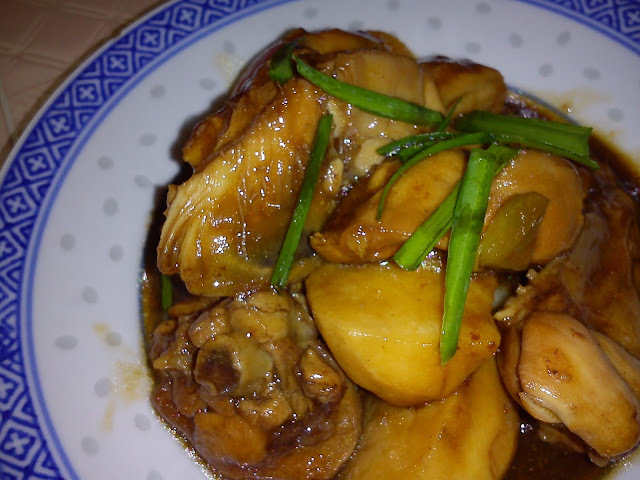 Here, I followed a recipe from Nyonya Flavours [my selected cookbook for Cookbook Countdown Event - February 2016]. I did some modifications, too according to my own preference. 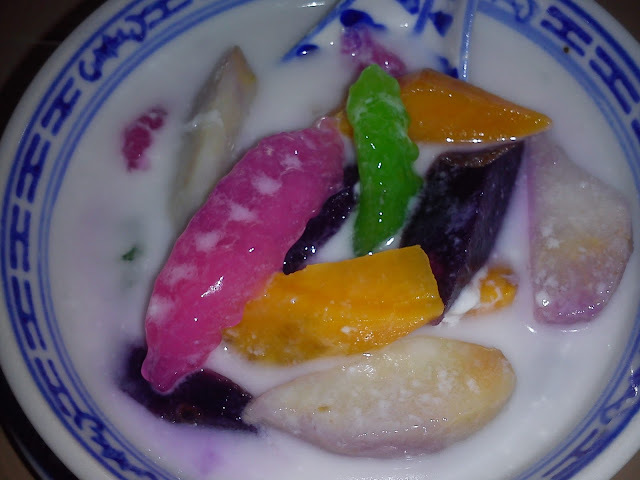 I omit the black eye beans, sago pearls and bananas. 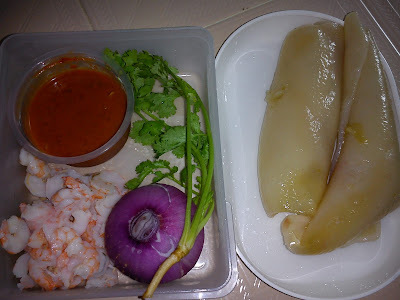 I didn't follow exactly the measurement of the sweet potatoes and taro cos' it isn't practical for me to get the stated quantity but I make sure that all these ingredients add up to the total weight. Anyway, I gave my neighbour a bowl of it and she gave this a thumbs up. My family enjoyed it too. 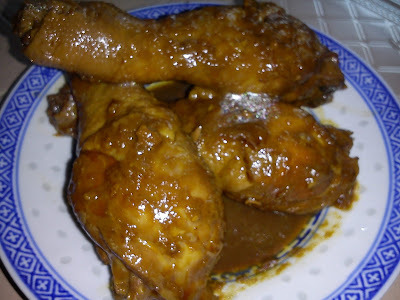 The sweetness is just nice for me and the coconut sauce is aromatic and tastes good. 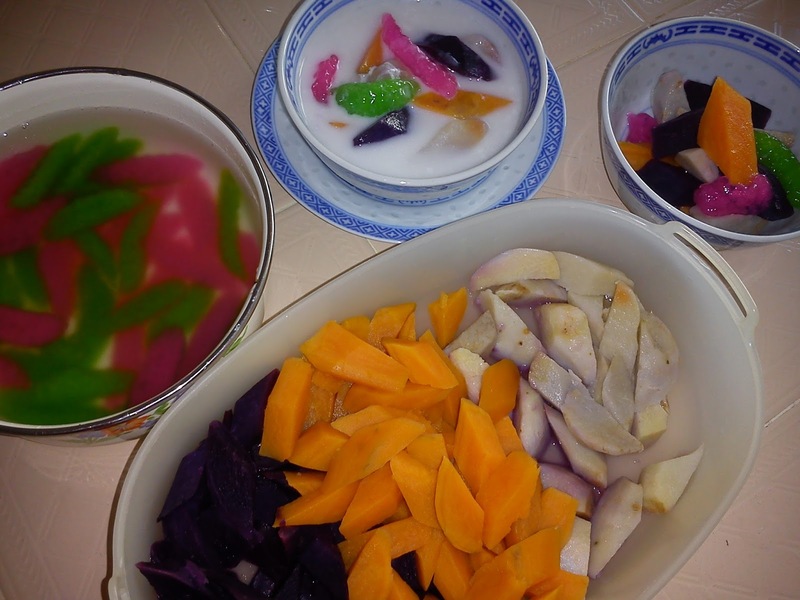 Actually, it is my hubby who requested that I cook 'Bubur Cha Cha' for him. This is a keeper. Peel and cut sweet potatoes and yam into cubes or other desired shape [mine is like diamond shape]. Steam separately for about 20-25 minutes or until cooked. Set aside. In a pot, boil beans in enough water to cover until soft. Drain and set aside. In a pot, boil sago pearls in enough water until they are translucent and cooked. Strain and keep the sago in a bowl of iced water until required. Peel and cut bananas into 1cm thick slices. To make the jelly, divide the flour into 2 portions in small mixing bowls. 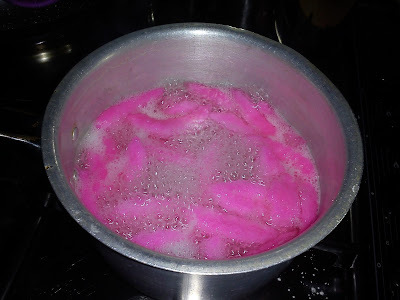 Add pink colouring into 60 ml hot boiling water and slowly add into flour to bind. Mix with a wooden spoon to incorporate well. When dough is cool enough, transfer to a piece of cling wrap. Lightly roll dough until smooth and use a cutter to cut into small pieces or any desired shape. Dust with some flour if necessary to prevent sticking. Bring a pot of water to boil, then drop in the cut tapioca dough to cook. 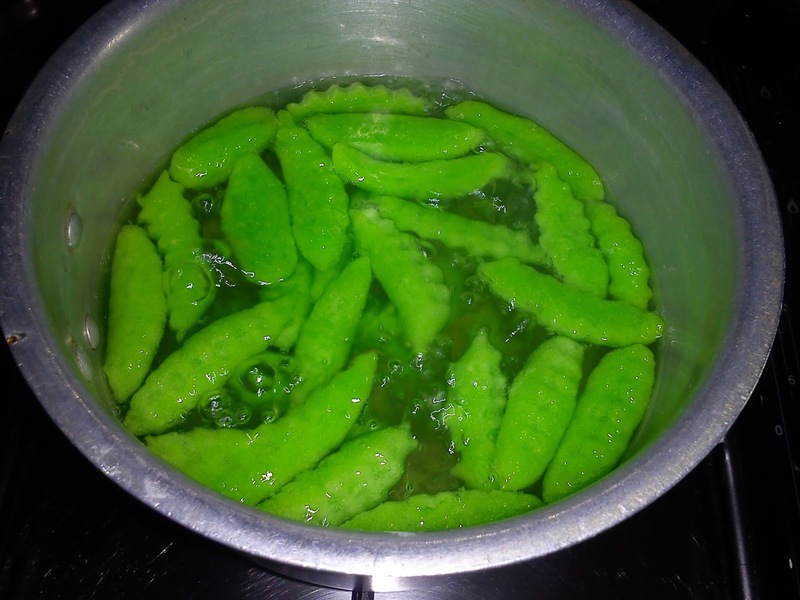 Boil until the dough is translucent and the pieces rise to the surface. Scoop out and plunge into ice water to stop the cooking. Keep them in the water until required. Repeat the same for the green colour. Bring water, sugar and pandan leaves to boil until fragrant and sugar dissolves. Add in coconut milk, bring to a simmering boil. Off heat, set aside. 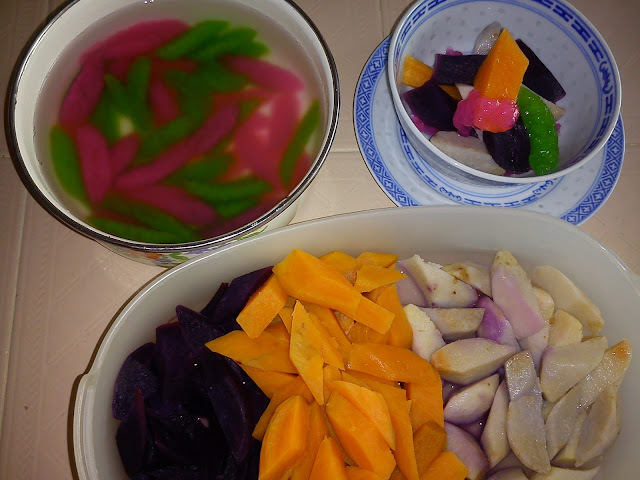 Put bananas, steamed potatoes, taro, black eye beans, sago pearls and tapioca jelly in a serving bowl. Scoop coconut cream sauce over ingredients. Serve hot or cold. I cooked this lovely dish with a new kitchen gadget. My brother in-law was backed for CNY and gave me this Thermal Cooker [a 7L La Gourmet Thermal Cooker]. 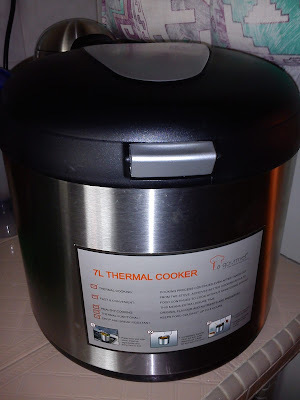 I didn’t know that cooking with this cooker just require about 10-15 minutes of cooking time. The remaining cooking process is left to the Thermal Cooker [without direct heat]. It really is an energy saver kitchen gadget. How soon the food is ready depends on what you are cooking. For chicken, it takes about 2 hours. 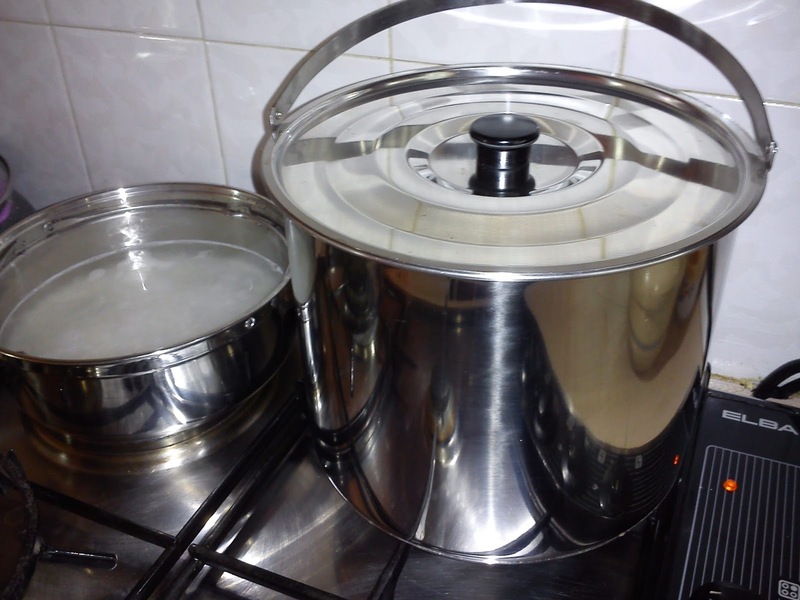 There are 2 separate stainless steel pots. 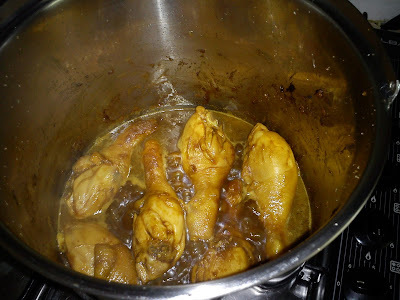 I used the small one to cook rice and the big one to cook this chicken. Safe time and energy. 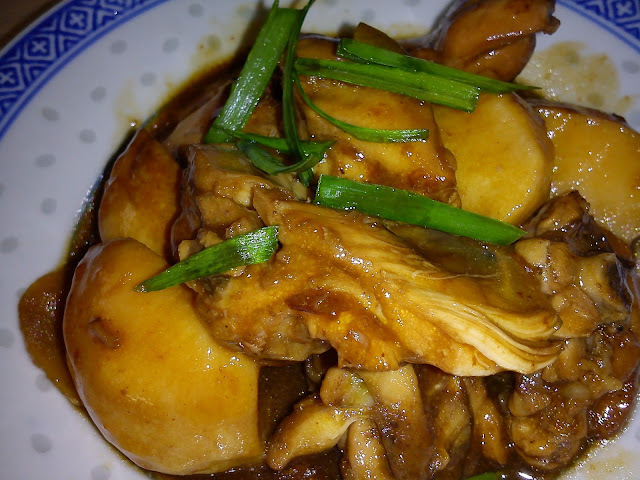 The chicken pieces and arrowroot wedges are just tender and has a bite. The sauce is thick and very tasty. 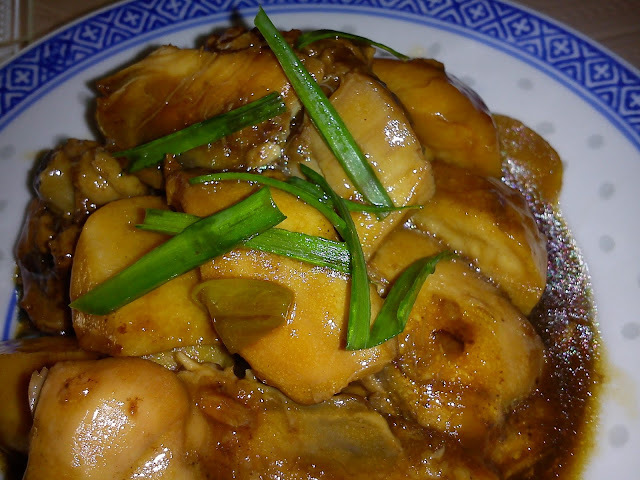 It is so delicious with rice. 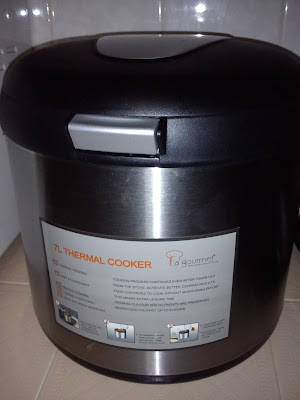 By the way, I used this cooker to cook Nyonya Curry Chicken, the curry was awesome. I just need to fry the ingredients until aromatic, bring to boil and leave the remaining cooking process in the outer pot. All the frying and boiling only requires about 15 minutes. Thanks to my BIL, I'll cook something good for him next time when he comes back. I think he knows that I'll appreciate this or is it that he enjoyed my cooking very much, hehehe! 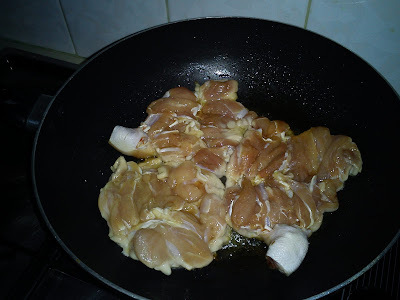 Marinate chicken pieces with some light soy sauce, 5 spice powder, sugar and potato starch. 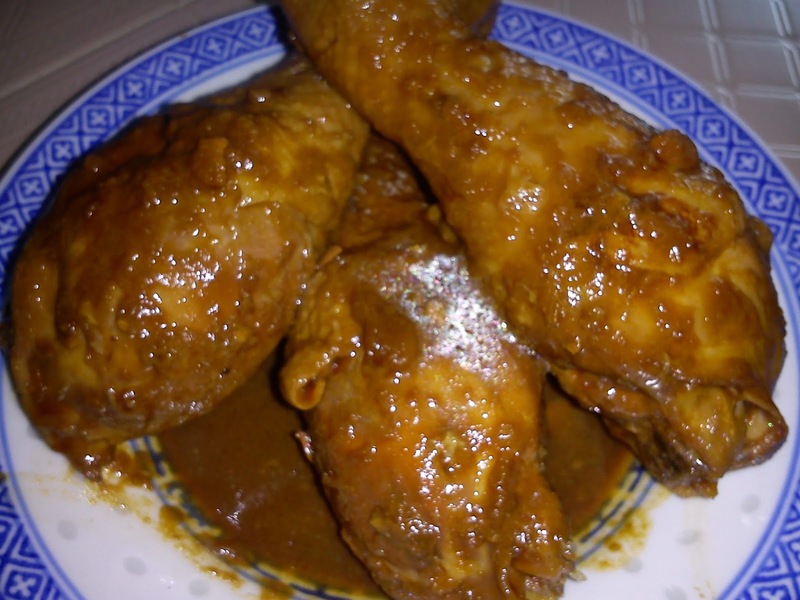 If Using a Thermal Cooker - Heat cooker pot, add in some cooking oil, fry chicken pieces and arrowroot until brown. Push aside, add in ½ portion of spring onions and garlic. 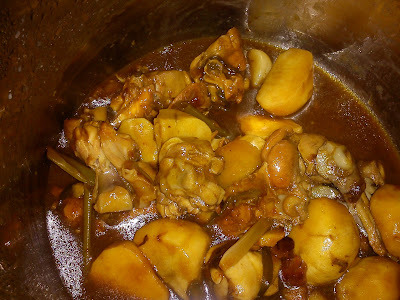 Fry until brown and fragrant. 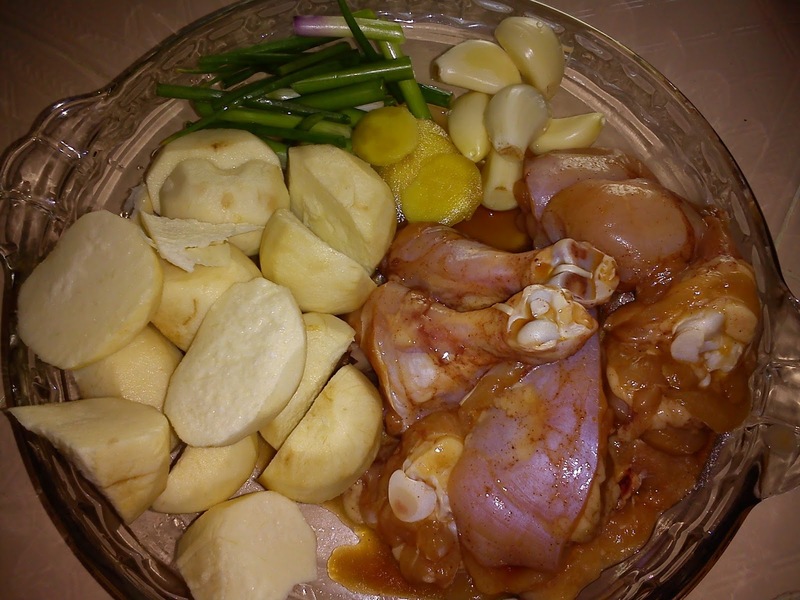 Mix with chicken and arrowroot pieces. 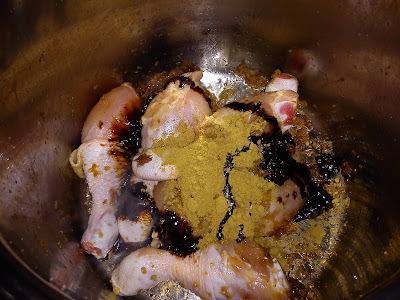 Add in seasoning, stir to mix well and add in some water [less required with this pot]. Bring to boil for another 5-10 minutes. Off heat. Immediately transfer it to the outer pot, cover and closed the lid. Leave food to cook for about 2 hours. Garnish with spring onions, serve. Note -The cooking time is different with what kind of food you are cooking. Food stays warm for 8 hours. Reheat the inner pot over stove if you prefer your food really hot]. 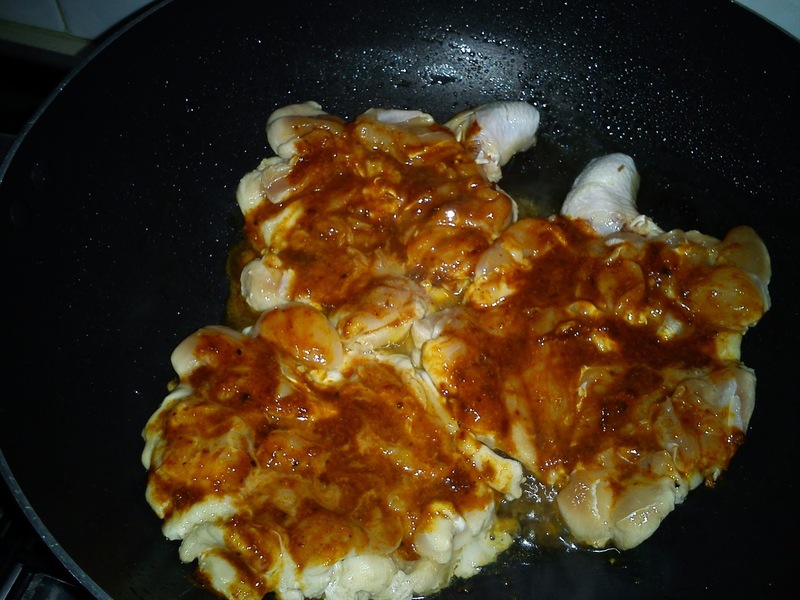 If Using Normal Wok - Heat a non-stick wok without oil, fry chicken pieces [skin side first] until oil oozes out and brown. Add in the arrowroot to brown, too. 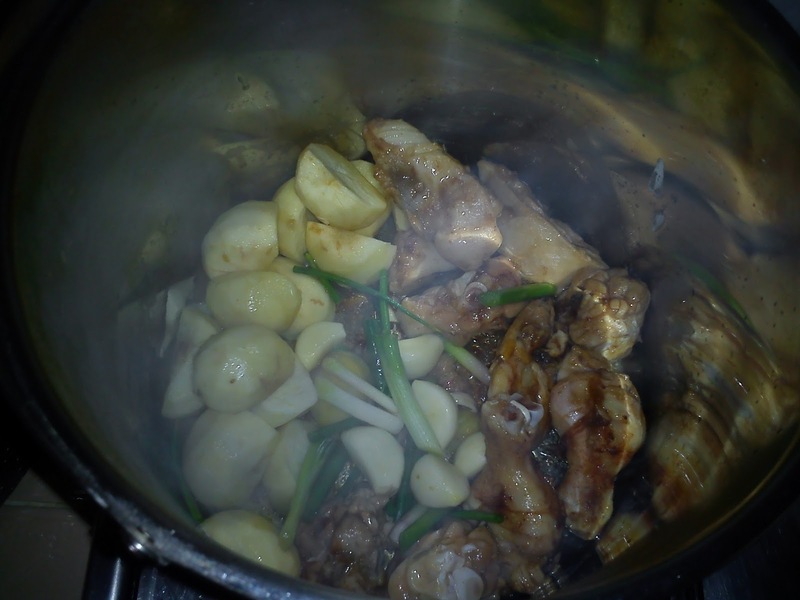 Push aside, add in ½ portion of spring onions and all the garlic. Fry until brown and aromatic. Then mix with chicken and arrowroot pieces. Add in seasoning, stir to mix well and add in enough water to cover ingredients. Bring to boil, then low heat to simmer until chicken and arrowroot are tender and gravy is reduced. Add in remaining spring onions. Dish up to serve.